After much research and Just Plain Thinking about what to get, the decision was arrived at, and the purchase made... The new arrival, just intsalled in the Lantern Sound mobile recording rig is a an ART Gold; a dual-channel, class A tube microphone preamp. The bonus was that it had already undergone a wise tube-swap: The crummy Chinese tubes (standard issue out of the box) had been replaced with Tung-Sols by the previous owner. The ART Gold undergoing gruelling quality-control bench testing upon arrival. The ART Gold intalled in the rack. 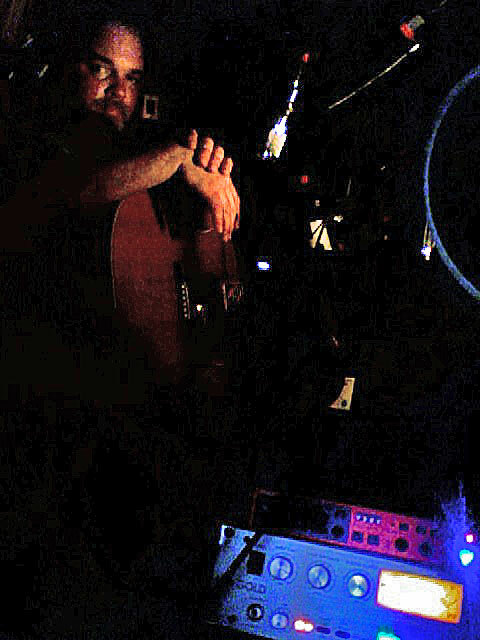 Edirol FA-101 digital interface glows upper left, RNC dual channel compressor lurks in the shadows, upper right. Mackie 1204 VLZ mixer is used for headphone/control room monitoring. 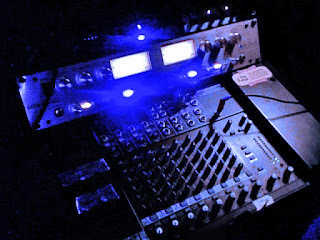 Mackie mic pre's are pressed into service when needed, directly feeding inputs on the Edirol. Edirol I/O sits atop the ART Gold. Jeff McLary of the Long Island Hornets volunteered to be a guinea pig for a tracking session "shakedown cruise" to run the rig through it's paces, and test out the new signal path routing. He performed one song live INSIDE the mobile van ("The Songtrailer"), just an acoustic guitar and vocal. 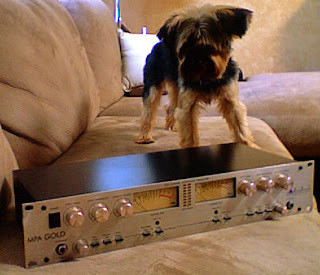 The Rode NT1 (original) large diaphram condenser mic was used on the soundhole of the guitar, and was routed through one channel of the ART Gold, while Jeff sang though MXL R144 ribbon mic (figure 8 pattern), using the other channel of the ART Gold. A Shure SM57 was used up on the neck of the acoustic, routed directly in to one of the mic pre's on the Edirol I/O. (Not an ideal mic choice, but never fear: A matched pair of small diaphram condenser mics are on the way).